My parents had one of those old-fashioned ice cream makers where the large metal canister sat inside a wooden bucket. Dad would bring home dry ice and we knew Mom was going to make ice cream, often banana, which was our favorite. Mom and Dad had to mediate the arguments between all of us kids on who got to lick the dasher, and sometimes Dad won and got the dasher all to himself. The memories of homemade ice cream tugged at me when we started having children, and I’m glad to carry on the tradition in our home. Last year Michael gave me a Cuisinart 2-quart ice cream maker and I immediately put it to good use. We found it at Costco in the stainless and black colors and saved about US$20 versus buying the all-stainless model. This type of ice cream maker has a heavy insulated bowl that must be frozen before use. Getting the bowl to the right temperature takes at least 8 hours in our freezer, and you can only make one batch before the bowl starts to be too warm. Once you’ve made a batch, you need to clean and refreeze the bowl before making another batch. The unit comes with just four parts: the main unit, bowl, paddle, and lid. Simply put the frozen bowl into the unit, the paddle into the bowl, then put on the lid. You can pour the ice cream/gelato base right into the bowl through the whole in the lid, which is also handy for adding mix-ins at the end of churning. Cleanup is a snap, just lift out the dasher and rinse out the bowl, dasher, and lid with warm soapy water. You can wipe the exterior of the unit clean with a damp cloth. We’ve been very pleased with the texture of the finished ice creams, though I wasn’t as happy with the gelato output, and once I read Making Artisan Gelato by Torrance Kopfer, I understood why. U.S. ice cream makers whip too much air into the mixture to achieve a true gelato texture, so to compensate at home, Kopfer recommends prefreezing the chilled custard about 30 minutes before churning. The gelato will chill faster in the maker, meaning less air gets whipped in. You may not achieve perfect gelato texture, but we found the prefreezing made our gelato better, such as this Malted Milk Gelato. 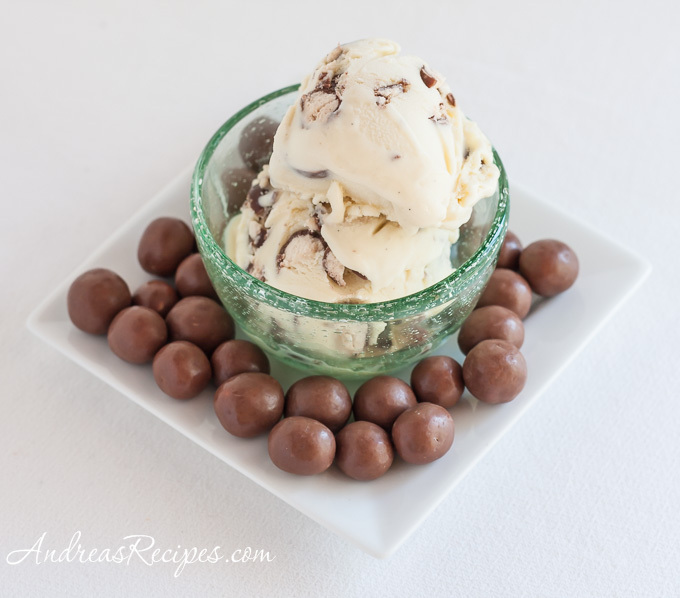 The Cuisinart ice cream freezer is perfect for our frequency of use and I give it a solid recommendation. 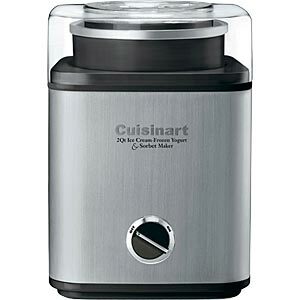 If I made ice cream several times a week or made large batches, I would be inclined to choose a White Mountain 4-quart Ice Cream Freezer or the Cuisinart ICE-50BC which has a commercial style compressor and can churn instantly, no need to freeze the bowl, though it has only a 1.5 quart capacity. But it’s probably a good thing I don’t make that much ice cream and gelato because I’d have to spend several hours a day spinning on the bike to combat the calorie and fat count. Pros: The price is right, doesn’t take up much room, easy to operate and clean, gets the ice cream and sorbet texture right. Also comes in a smaller, cheaper 1.5-quart size. Cons: Must put bowl in the freezer at least 24 hours before making ice cream, extra step required to get best gelato texture, additional freezer bowls are costly but helpful. Materials: The model from Amazon and other stores has a brushed stainless steel exterior, while the less expensive version from Costco and BJs is brushed stainless with black plastic as above.